Click to download the free e-book, Go Play! 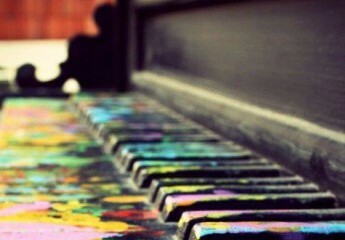 for insight into the new generation of piano students. The world is changing and so are our students and how they learn. Read what others are saying…..
My online friend Catherine Shefski has written a terrific — and important — book. 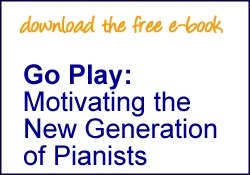 It’s an ebook, not very long, called Go Play, and it’s about piano teaching. I’m going to be very direct about this: everyone should read it. I’m a really big fan of this eBook. It’s short, just 14 pages. It addresses a topic not considered by many teachers and does so in a clear manner. Those teachers not familiar with the Web 2.0 generation need to read this book. If you are tech savvy then be sure to pick up a few more tips. Best of all the book is free. I just finished reading Super Sad True Love Story by Gary Steyngart. It is a 1984ish, satirical picture of what can happen when all of our information is distributed through social media. The hero actually reads books–old ones, and they smell! His love has never read a book and communicates mostly in four letter word laced text-speak. Society is shallow and well rounded education mostly a thing of the past. Go Play! Motivating the New Generation of Pianists by Catherine Shefski gives all of us in the music teaching community similar food for thought. What kind of students are we teaching? Are they consumers or creators? Connected or isolated? Is the ability to play that Beethoven Sonata or Bach Prelude and Fugue the ultimate goal of study? What does it mean to be successful as a musician? This short, free eBook is a great manifesto for the future of music teaching. Calling out the standard, traditional methods as outdated and unlikely to keep the attention of young 21st century students, author Catherine Shefski of the All Piano blog doesn’t just stop at pointing out the problems. She outlines a variety of approaches, ideas and exercises designed to engage modern students on their own terms, rather than trying to drag them over to the classical school (which is so remote from their life outside the classroom). Have you seen Catherine Shefski’s free eBook, “Go Play“? One of the teachers in our local association alerted us to it and we used it as the basis for our discussion at our local association meeting last week. Our official discussion topic was, “The Millenial Student,” and another teacher also shared several recent magazine articles that addressed the same issue. It certainly does lend itself to a thought-provoking discussion when you contemplate how the changes and technological advancements impact the way we are teaching this generation of students. I’ve been especially challenged to branch out and try new things even if I don’t have a clear view of what the path to our final objective looks like.